The SP-BSP candidate Praveen Nishad, who had won the Gorakhpur bypoll, recently switched over to the BJP. He has been rewarded with a poll ticket from Sant Kabir Nagar, Mr Tripathi's current parliamentary seat. In 2018, Mr Nishad's shock win over the BJP candidate helped cement the SP-BSP-RLD alliance in the state. 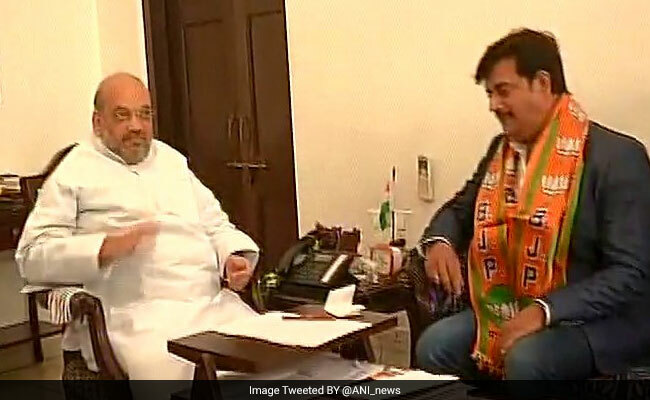 A week ago, however, his outfit announced it was switching over to the BJP, saying it was upset with Samajwadi Party chief Akhilesh Yadav for not giving them enough seats in eastern UP for the Lok Sabha election. Sharad Tripathi, the current BJP parliamentarian from Sant Kabir Nagar, is not on the list of candidates. Last month, Mr Tripathi was caught on camera hitting BJP legislator Rakesh Baghel with his shoe, with both lawmakers hurling abuses at an official meeting. The fight had broken out after Mr Tripathi asked why his name was not on the foundation stone for a local road. Rakesh Baghel said it was his decision. Mr Tripathi's father Ramapati Ram Tripathi, however, has been fielded in Deoria. Ramapati Tripathi has been a former chief of the BJP's state unit and is close to Rajnath Singh, Union Home Minister. Ravi Kishan is the second Bhojpuri actor fielded by the BJP in eastern Uttar Pradesh. Dinesh Lal Yadav, popularly known as "Nirahua", is fielded against Akhilesh Yadav in Azamgarh. A famous name in the Bhojpuri film industry, Mr Yadav was a contestant on Bigg Boss 6 in 2012. He has starred in blockbuster movies like-- "Patna Se Pakistan", "Nirahua Chalal London","Nirahua Rickshaw Wallah" and "Nirahua Hindustani". The Azamgarh seat was won by Mulayam Singh Yadav in 2014. This time, however, the former Samajwadi Party chief has shifted back to the family bastion of Mainpuri, making way for his son.